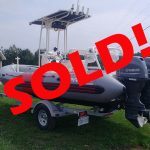 After seven successful years of business, Larry & Lynn Graham passed the ownership of Grahams Marine over to Jeff Krampien in October, 2009. Jeff Krampien is no stranger to the area providing service over the years from first Wiarton and then Owen Sound. His newly acquired business has been renamed Tobermory Marine and Jeff will continue to provide boaters what he knows best; customer service! Jeff brings over 30 years in the boat repair industry, from structural repairs, rigging and major mechanical refit. In the past Jeff has provided customers comfort when dealing with his staff and getting the boat to the water in the right amount of time, and on budget. Most may know Jeff from his previous employment; Yard Manager of the Wiarton Marina and General Manager of the Owen Sound Marina. 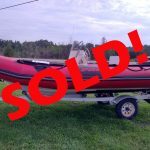 Jeff has a solid understanding of a customers needs and how the boat yard works closely with the owner as well as knowledge of the industry and networking with other industry professionals. Let his experience save you time and money when you start your next project on your vessel. If it is just a Spring service of a major refit, please take a minute to call Jeff before starting to work on your boat. Currently, Jeff is working with two of the largest inflatable companies in North America to provide sales and service to people who love their inflatables. Jeff is a certified repair technician as well as certified by Zodiac Canada. He can fix those leaks and repairs to get you out on the water sooner. No need to send your boat to Toronto for expensive repairs. Let his team work for you! the expansion of the service department; additional qualified service technicians to look after the customer’s boat in a timely manner. the newly purchased con-o-lift hydraulic boat trailer which met with a warm welcome in Tobermory. Jeff has been able to work around peoples schedules with the launching and hauling of their boats, no more rush to get it all done in one day like in the past. Tobermory Marine can haul vessels up to 32,000 lbs and can arrange long transport within Ontario. an additional storage building was added to the existing three buildings approaching 20,000 square feet. Jeff now has the largest inside storage facility within 200 miles. 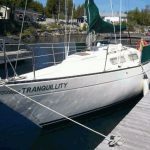 He has always had a keen eye in proper boat storage and the security and increased value the boats bring only being outside for summer months. 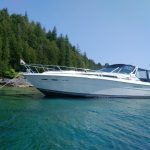 Tobermory Marine will stay open in the 2009,2010 winter to work on larger customer projects with the anticipation to get these boars ready for spring launch. If you haven’t been able to visit the Retail Store, please drop us a line and let’s see if we can provide you the products you need at a competitive price backed up with over 30 years of exposure in the Marine Industry in Ontario. Hard to find in a mail order store! We are all excited that you have taken a good look at our web site and what we have to offer. 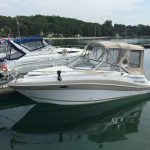 You will find that we can help you whether you are looking for a boat for sale in Owen Sound, or are looking for boat repair in Guelph. 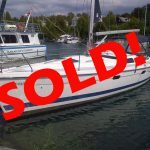 Please consider Tobermory Marine the next time you need to have anything done to your boat. We still offer free estimates and a warm smile when your boat is not working the way it should. Please take a moment to introduce someone new to the boating lifestyle. We all need to encourage and promote boating in Ontario, we are truly blessed to be able to run our boats in what we feel is the best boating area in Ontario. You can contact the office or the store to discuss your needs and wants, please remember boating is for the summer so let’s fix you boat in the winter to maximize your boating enjoyment. RR # 1 Tobermory, Ont. We look forward to working with you and thank you for visiting our site!!! Jeff Krampien is pleased to announce that Tobermory Marine is now an official Volvo Service Dealer. This, in addition to our ability to service all makes & models also permits us to perform warranty work on Volvo Penta as well as Yamaha Marine systems. We will now have easier access to a wider range of parts and accessories enabling us to more effectively service the growing number of Volvo customers. We welcome your inquiries and suggestions and look forward to another great boating season.